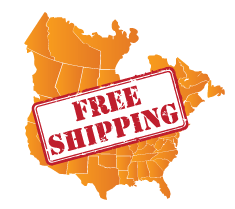 Bokashicycle Food Waste Pulverizing Machine - World Wide Shipping Rates! Shredding and compacting food waste in a container can immediately translate into significant savings by allowing more waste to be put into the same size container. Bokashicycle provides to the consumer a high throughput food waste pulverizing machine that plugs into any 220 volt standard outlet. This powerful 3 HP machine with an attached step-platform makes it easy to send all of the food waste directly into a 55 gallon barrel. The large hopper has a metering forward and reverse 220v motor to move waste into a thrashing chamber where the waste will be immediately pulverized. Waste exits the thrashing chamber quickly to fill the 55 gallon barrel. Each full barrel will hold approximately 500 pounds of food waste. The Bokashicycle Food Waste Pulverizer was designed to make it easy to dispose of waste. The chain wall interaction with food waste results in ripping, tearing, crushing, and cellular disruptions so that bokashi microbes can very rapidly cause the waste to be fermented. Add a handful of bokashi culture mix to each 5 gallon bucket of waste and run it through the pulverizer. Move the machine to the side and seal the fermenter (55 gallon barrel) with the band clamp lid provided and the waste will be transformed into a bio pulp in approximately 10 days. Pathogens are destroyed in the fermenting process and there is no putrefaction or unpleasant odor, insects, or vermin to worry about. Rats will not be attracted to the fermented food waste. The Bokashicycle Food Waste Pulverizer is designed for many different users. Restaurants, hotels, casinos, country clubs, schools, grocery stores, farmers and other businesses where food waste is generated can process their food waste on-site to eliminate noxious odors and nuisance problems. The 25 foot electric cord makes it easy to reach a 220 volt standard outlet. The machine can be operated either indoors or outside and rolls easily on 4 swivel wheels for easy positioning over a 55 gallon barrel. This machine is designed with safety in mind. The hopper swings down easily allowing access to the thrashing chamber. The chain walls are easily replaced should they ever need to be replaced and are inexpensive. There are no moving blades that will ever need sharpening. Expensive repairs are avoided by design. Most importantly, safety switches are activated any time the hopper is moved away from the thrashing chamber so that no accidental start up can occur when the box is being inspected. 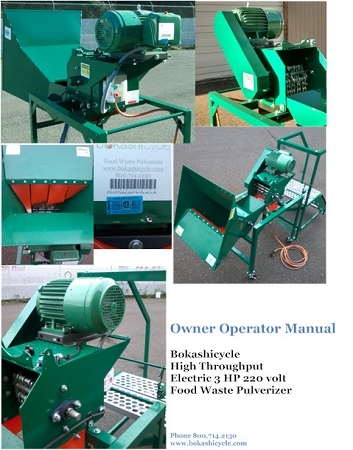 The Bokashicycle Food Waste Pulverizer is ready to run immediately upon delivery. The 3 step-platform is assembled and the tread bolts are secured allowing access to the hopper. A standard 220 volt outlet within 25 feet of the machine is all that is needed then to start the operation.